This recipe is a very simple way to use up your leftover pasta or noodles in the fridge. I think I picked this up from a cooking show many years back and it was paired with a simple lemon chicken (I’ll try to cook and write about that another day). It’s delicious and filling even on its own, as well as a good base for whatever vegetables or protein you want to add. 1. Saute garlic and ginger in olive oil over low heat. 2. 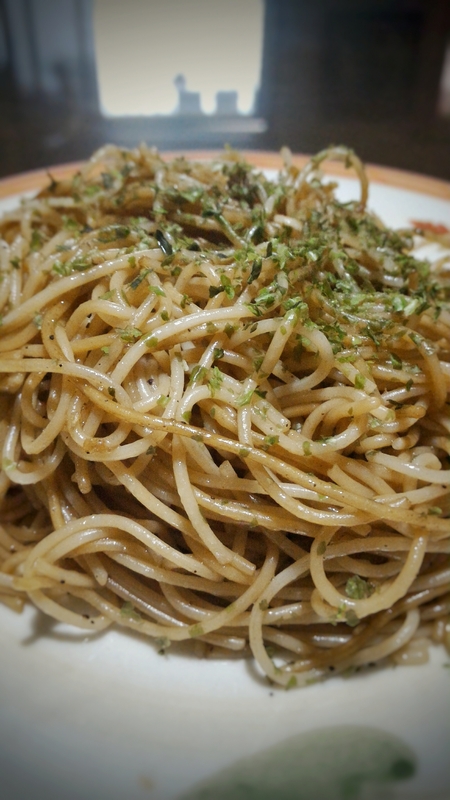 When garlic turns slightly brown add soy sauce, a few drops of sesame oil, and pasta. Be careful with the amount of soy sauce to prevent the pasta from getting too salty. 3. Season with some pepper and lemon juice. Sprinkle aonori and/or furikake. Bon appetit! You may add veggetables like bell peppers, cabbage, snow peas, and carrots. If you want protein in this dish feel free to chuck in some cooked pork, chicken, or beef slices. I just thought of adding in the optional ingredients as I was cooking so please feel free to get creative and put your own spin on this recipe. I promise that this dish is as easy as it is delicious and it’s a great addition to your bag of kitchen tricks.